Google rewards the most prominent and popular businesses in their market areas, with you guessed it – page 1 rankings. Google’s algorithm wants to mirror the real world as closely as possible and therefore rank websites that are most popular the highest. With the right knowledge and tool you can gain back control over your reputation, what appears when someone performs searches for your brand, keyword, products and services. You want to make sure that the information people find is accurate, up to date and consistent over all your platforms. This aligns with SEO and makes sure Google’s algorithm knows can paint a more desirable picture of your online business. How Can You Control What People See? First besides you SEO strategy you need a Google Business Account. Next you need to ensure to control all pages you have control over, like your website, blog posts and guest posts as well as your Google Business account reviews. Is all the content up to date? Does it contain all the info you want your target audience to know and see? By gaining back control over these things you are on a good way to improve your reputation management and SEO visibility long term. Most people think reputation management is cleaning up your negative content or pushing negative references far down in the search results. But managing your online reputation is beyond just that. As you can see our client is on top of the maps results with a 4.7 star rating. 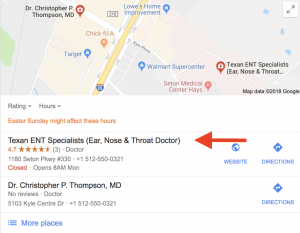 This star rating is part of the Reputation Management and SEO strategy we developed for TexanENT Specialists. It is getting increasingly complicated for businesses to manage their reputation online and controlling what appears for their brand, because SEO and Reputation Management play hand in hand. Especially reviews are highly important for businesses online. They can sway the customer’s decision of contacting your business or not. Entrepreneur Dave Kerpen writes more about how negative online reputation hurts your business. With a dedicated agency or individual inhouse you can build a strong online presence for your business, involving in depth SEO knowledge and reputation management skills. With proper plans and strategies for both, you are able to build a sustainable online presence for your business and nurture it. Enhancing accessibility, enable effortless marketing, building relationships and trust with (potential) clients and underlining your expertise. The more your business shows up online for your industry, the more clients see you, the more exposure you gain, the more you establish your business as relevant and as an expert for your industry. Imagine a potential clients looks for your service online. We already know that about 80% of the traffic stays on the first page of Google. Present yourself there well, make sure you appear in the organic search results and the maps listing with great star ratings and reviews. The better your star rating, the more reviews you have, the more likely it is that your business receives the call or email from a client and not your competition. One negative review can cost you 22% of potential customers, especially if you cannot compensate it. A well maintained reputation management and solid SEO plan are the keys to the top of Google’s first page and should be on (top) the agenda of every business with an online presence.